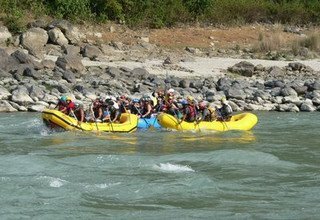 Rafting on the Trishuli River is perhaps your favorite way to observe the diversity of demography, landscapes, cultural heritage, flora and fauna. You can experience the thrills of the wild water on the course of a two days trip. 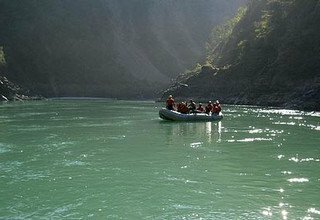 The Trishuli is the most easily accessible river from Kathmandu, Pokhara and Royal Chitwan National Park. These trips fit for experienced as well as first time rafters. 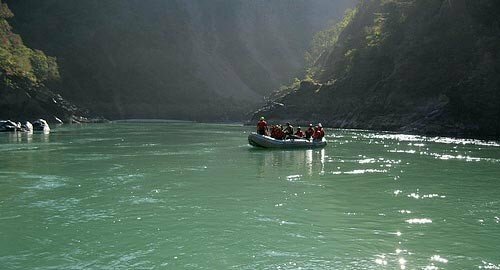 There are exhilarating rapids, impressive gorges, scenic valleys and easier sections, which you will never forget again. The rafting will be degraded upon your choice. So let us know about your interest, time and how thrilling the whole experience should become and we’ll organise the perfect trip for you. During the monsoon, the Trishuli River promises even a more challenging ride. The river is running high and wild, with powerful rapids and whirlpools. 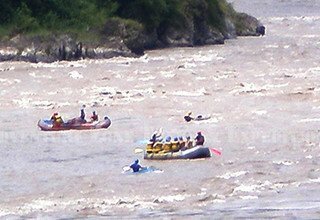 That’s the season, when there are hardly any other rafters around… and rafting on the Trishuli River is, without a doubt, the most exciting thing you can do in Nepal during monsoon,’ whitewater becomes wildwater rafting’. And quite possibly it is one of the best two days lasting ‘big water rafting’ trip offered anywhere. There are numerous exciting rapids on this route, known as; Snail's nose, Teendevi, Malekhu rapid, Monkey rapid, Upset, Surprise, Monsoon, Cotton Pony, Ladies Delight, S-Bend, Highway, Pinball and Monsoonrapid. This makes your fun more challenging during high flows with a good mixture of continuous rapids and pleasant calm water. Evtl. connection Trip: Royal Chitwan National Park or trek to Annapurna region. * All transportation from and to the Rafting Points. * All Safety Equipments (Life jacket and helmet while on rafting). * Water proof Bag for your valuable things. * All meal during the Rafting Period (3 meals a day, Breakfast, Lunch and Dinner with Tea, Coffee and Hot Water). * 1 night accommodation at tented camp. 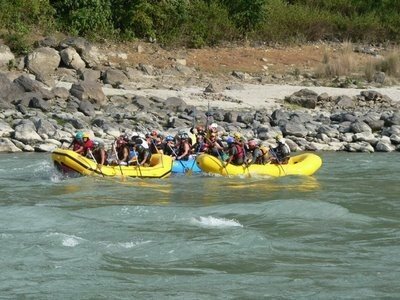 * Full rafting staff (crew) including guides, helper, and cook and as per requirements. * Transportation to your next destination.